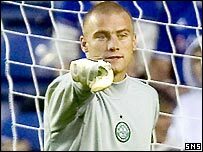 Celtic goalkeeper Artur Boruc was cautioned for inciting an Old Firm crowd rather than for blessing himself, the Crown Office has stressed. In a statement issued on Monday, it said the "very limited" action had been taken against the player for gesticulating at the Rangers support. He had also blessed himself in the incident during the Ibrox match. But the Crown Office stressed it would not take action against individuals for "acts of religious observance". "We would equally make clear that the police and prosecutors cannot ignore conduct which appears to be inciting disorder," said a spokesperson. The Crown Office said it issued the statement to "set the record straight" about the action taken against Boruc over the incident at the match on 12 February. The player received a fiscal's caution for breach of the peace as an alternative to prosecution. Initial reports suggested that action was taken against Boruc for blessing himself before the start of the second half. The Crown Office issued a statement on Saturday in which it said its decision was taken "based on an assessment of behaviour, not one single act, which appeared to be directed towards the crowd". It said he had "provoked alarm and crowd trouble" which constituted a breach of the peace. The statement issued on Monday said police officers and members of the public had seen Boruc blessing himself. "Witnesses describe him smiling or laughing at a Rangers section of the crowd and making 'come on' gestures," said the statement. "This action appeared to incense a section of the crowd to react in such a way that police officers and security personnel had to become involved to calm the situation. "The police have reported that it took 10 minutes to restore normality in the crowd." A report was sent to the procurator fiscal in Glasgow, who decided to deal with it by using an alternative to prosecution. "In using that alternative she (the divisional fiscal) made it clear in writing to Boruc that it was his alleged gesticulating to Rangers supporters in a provocative manner which was of concern," said the statement. "She did not in any way refer to the act of blessing himself." First Minister Jack McConnell said politicians should be "very careful" when commenting on such matters. "I do think it is important that, while these stories can be sensational and can be interesting for everybody, that we try this week of all weeks, when we start a new European Championship campaign, to concentrate on the positives about Scottish football," he said. However, Scottish National Party leader Alex Salmond said the Crown Office had "bungled" the affair. The party's Roseanna Cunningham also said the reassurance that the Celtic goalkeeper had been cautioned for gesticulating at Rangers fans and not for blessing himself, was "too little, too late". She said the damage had already been done to Scotland's reputation. There was also condemnation from the Roman Catholic Church in Scotland, which said a gesture of religious significance should not be considered offensive. Bishop Joseph Devine welcomed Monday's clarification and the fact that the fiscal did not refer to the blessing. He added: "Equally, the Crown Office statement that they fully respect religious belief and practices and 'would not countenance formal action against individuals for acts of religious observance' is both welcome and reassuring."